They are situated just below the symphysis menti. They receive lymph from the midline of the lower lip, chin, tip of the tongue and related areas. They are situated along with submandibular salivary gland between the layers of investing layer of deep cervical fascia. Frontal, maxillary, anterior and middle ethmoidal air sinuses. Medial part of the eyelids. Anterior half of the lateral wall and septum of nose > Lips and cheek. Floor of the mouth Anterior 2/3rd of palate Submandibular salivary gland etc. This lymph node belongs to submandibular group. 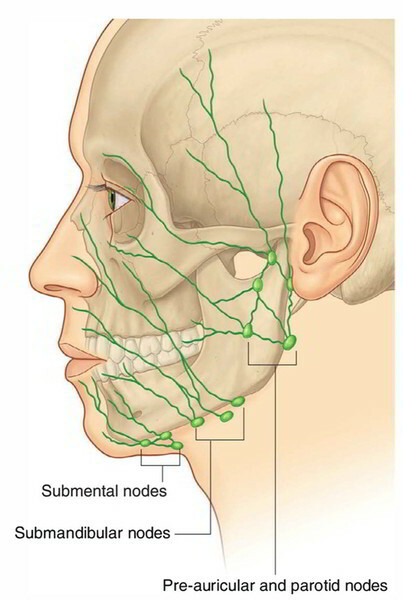 It is situated along the bend of facial artery, before entering the face. Lymph from these nodes enter the jugulo digastric and juguloomohyoid lymph nodes. They are situated anterior to the auricle. They receive lymph from the lateral half of the eyelids, conjunctiva, cheek and parotid region. Ulcers of the tip of the tongue or boils in the chin causes enlargement of submental nodes. Submandibular lymph nodes are enlarged and tender during the inflammation of their area of drainage, eg. sinusitis involving frontal and maxillary sinuses, caries teeth, infection of tongue, palate. During carcinoma of cheek, lips, tongue etc. Secondary deposits enter the submandibular nodes. Subsequently the submandibular, salivary gland and mandible are affected. During infections of the orbital contents and eyelids the preauricular nodes are inflamed. During malignancy of the tongue the lymph node of Stohr must be removed.